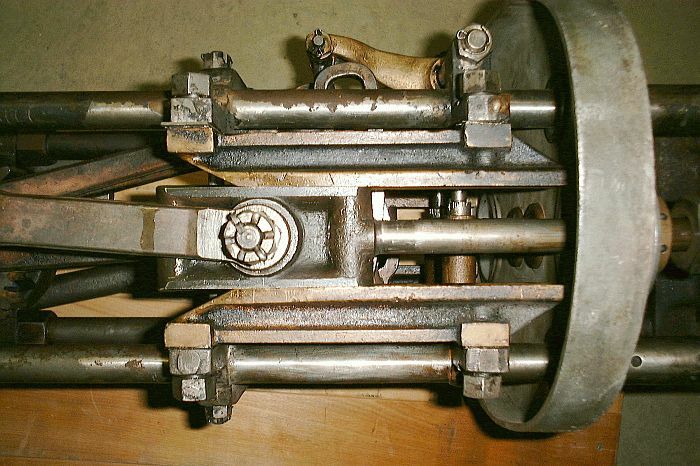 The piston rod crosshead is shown at the center of the photograph sandwiched between the crosshead guides. The connecting rod is bolted to the piston rod crosshead and runs off the left center of the photograph. The crankcase contains about a gallon of steam oil for lubricating the engine. 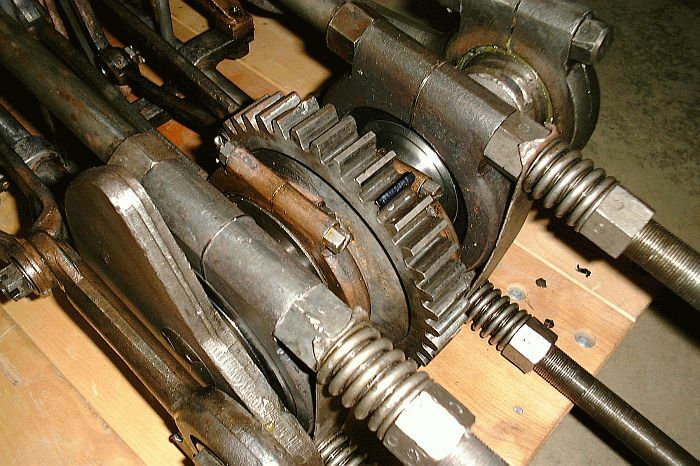 As the engine runs the crankshaft counterweights and connecting rods splash the oil around inside the engine case and provide lubrication to the sliding surfaces of the crosshead. 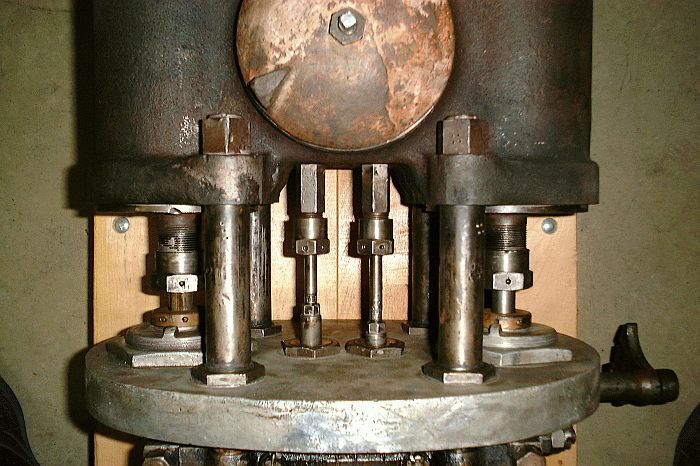 Close-up photograph of the valve and piston rods. The dome shaped valve cover has been removed providing access to the D-slide valves. 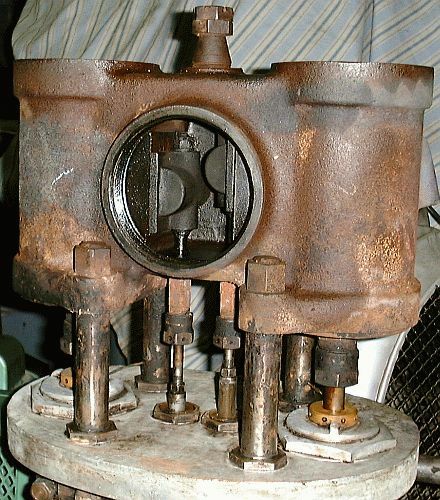 The right cylinder's valve is clearly seen in the photograph. The valves move over ports in the cylinder casting admitting steam to the cylinders as well as exhausting spent steam from the cylinders. Oil is injected into the engine's steam supply to lubricate the valves and pistons and provides the dark color to the valve area. This close-up of the engine crank shows the 40-tooth gear that meshes with the differential gear of the rear axle. To either side of the gear are the link rods. Further out are the main crankshaft bearings which position the crankshaft on the engine support rods. 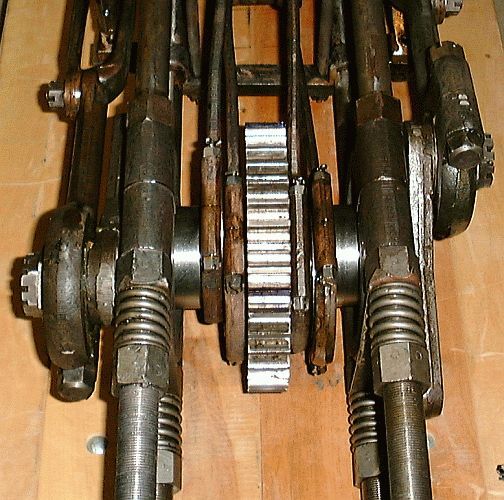 At the outer ends of the crankshaft are the counterweights and connections for the connecting rods. 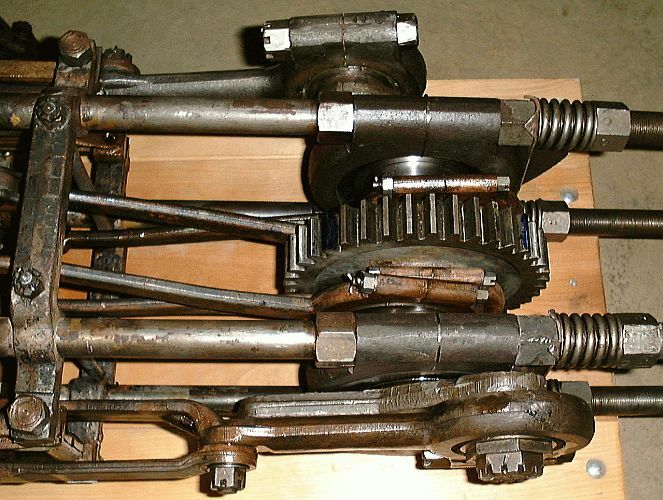 This side view of the crankshaft shows the connecting and link rods for the left cylinder. The crankshaft from directly behind the engine.